Moses Moe Tawil (1915-2018) was born in New York City to Yael (Shrem) and Abraham Tawil. Moe Tawil’s communal activities began when his father passed away and Moe was 18 years old. He was part of the group that formed Bnai Magen David (Young Magen David), of which his brother, Isaac A”H, was the first president. Once Moe married, he joined the committee of the Magen David Yeshiva Hebrew School. Moe and his brother, Isaac, served on the board of the Yeshivah of Flatbush and were among the leaders involved in building the main edifice on East 10th street in Brooklyn together with his brothers Harry and David and all of their families. Moe is an active member of the board of Congregation Shaare Zion. He served as the President of the Bradley Beach Synagogue where he established the first day camp in the Sephardic community, Magen David Day Camp of Bradley Beach. He served on the board of directors of Magen David Yeshiva. 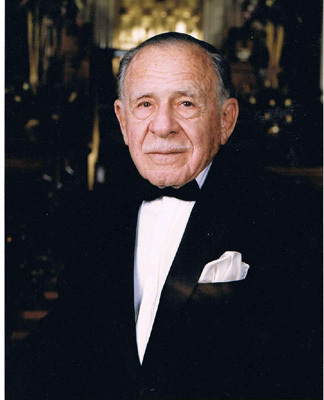 Moe was instrumental in establishing the Hallandale Beach Synagogue in Florida and was responsible for a Sephardic shul and minyan in the Concord Hotel for 35 years. He has served on the board of directors for the Deal Synagogue and was involved in the founding of the magnificent Sephardic Community Center on Ocean Parkway in Flatbush. Moe is the founder and director of the Moe Tawil Cantorial Seminary. Moe was invited twice to Israel to establish a program to maintain the Sephardic liturgical musical tradition for Hazzanim, out of which Tiferet HaMizrach was established, a group of Hazzanim who have been coming to the United States to perform on holidays as well as at concerts. Moe has instructed and lectured on Sephardic Liturgical music at New York University, Hofstra, and Yeshiva University, and continues to guide many of the Hazzanim in the Syrian community. Moe Tawil passed away on February 1, 2018, at the age of 102. May his memory be blessed.